Deep-water turbidite systems: a review of their elements, sedimentary processes and depositional models. Their characteristics on the Iberian margins. Bottom current processes along the Iberian continental margin. Submarine mass movements around the Iberian Peninsula. The building of continental margins through hazardous processes. D. Casas, D. Casalbore, M. Yenes and R. Urgeles. Oceanographic processes and products around the Iberian margin: a new multidisciplinary approach. F.J. Hernández-Molina, A. Wåhlin, M. Bruno, G. Ercilla, E. Llave, N. Serra, G. Roson, P. Puig, M. Rebesco, D. Van Rooij, D. Roque, C. González-Pola, F. Sánchez, M. Gómez, B. Preu, T. Schwenk, T.J.J. Hanebuth, R.F. Sánchez Leal, J. García-Lafuente, R.E. Brackenridge, C. Juan, D. A.V. Stow and J.M. Sánchez-González. Shelves of the Iberian Peninsula and the Balearic Islands (I): Morphology and sediment types. 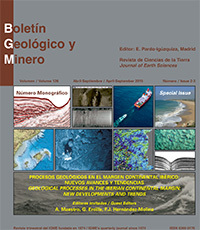 L. M. Fernández-Salas, R. Durán, I. Mendes, I. Galparsoro, F. J. Lobo, P. Bárcenas, F. Rosa, M. Ribó, S. García-Gil, A. Ferrín, G. Carrara, C. Roque and M. Canals. Shelves around the Iberian Peninsula (II): Evolutionary sedimentary patterns. Morphodynamic characterization of the Spanish beaches of the Gulf of Cadiz. The influence of tectonic and volcanic processes on the morphology of the Iberian continental margins. Seamounts along the Iberian continental margins. Continental margin radiography from a potential field and sediment thickness standpoint: the Iberian Atlantic Margin. A review of the current knowledge of the crustal and lithospheric structure of the Valencia Trough Basin. C. Ayala, M. Torne, and E. Roca. Origin of carbonate concretions from mud mounds in the Gulf of Cadiz (SW Iberian Peninsula). Shallow gas in the Iberian continental margin. Techniques for the non-destructive and continuous analysis of sediment cores. Application in the Iberian continental margin.